So, the next path on the road to fast mobile data, 4G LTE finally launches in the UK, after much barracking from competitors, on the “EE” network (the combined Orange and T-Mobile brand). It’s only available in a handful of markets at the moment, and the BBC’s tech correspondent, Rory Cellan-Jones, did many articles for TV and Radio yesterday, while conducting countless speedtests, which he has extensively blogged about. Some of the comments have been that it’s no better in terms of speed than a good 3G service in some circumstances, while others complain about the monthly cost of the contracts. The initial cost for the early adopters was always going to attract a premium, and those who want it will be prepared to pay for it. It’s also worth noting that there are no “all you can eat” data plans offered on EE’s 4G service. Everything comes with an allowance, and anything above that has to be bought as “extra”. The most concerning thing as far as the commercial package goes are the minimum contract terms. 12 months appears to be the absolute minimum (SIM only), while 18 months seems to be the offering if you need a device (be it a phone, dongle or MiFi), and 24 month contracts are also being offered. Pay As You Go is not being offered on EE’s 4G service (as yet), probably because they’ve no incentive to, because there’s no competition. Are EE trying to make the most of the headstart they have over competitors 3, O2 and Voda and capture those early adopters? Rory Cellan-Jones referred in his blog about problems with reduced performance when in buildings. A number of factors affect the propagation of radio waves and how well they penetrate buildings and other obstacles, such as the nature of the building’s construction (for instance a building which exhibits the properties of a Faraday Cage would block radio signals, or attenuate them to the point of being useless), but also the frequency of the radio signal. Longer wavelengths (lower frequencies) can travel further and are less impacted by having to pass through walls. 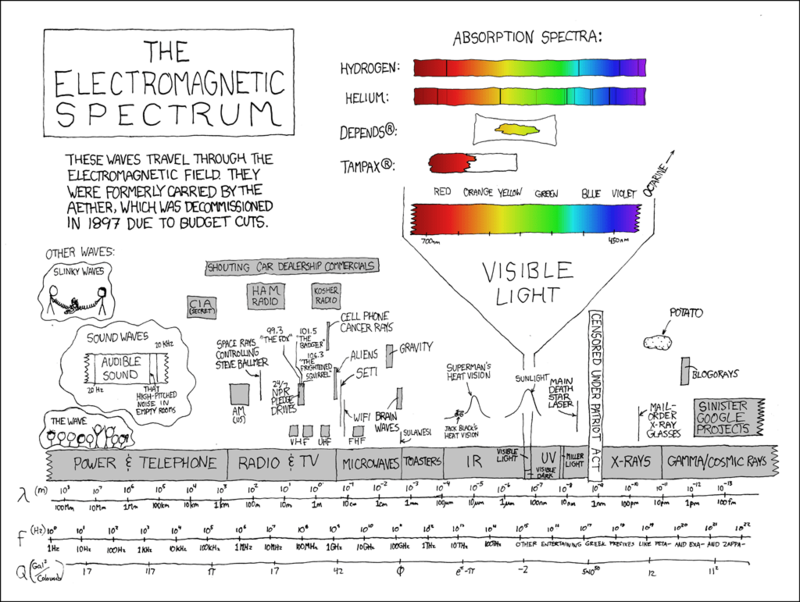 I’m sure there’s an xkcd on this somewhere, but the best I can find is this…. The reason EE were able to get a steal on the other mobile phone companies was because OFCOM (the UK regulator, who handle radio spectrum licensing for the Nation) allowed EE to “refarm” (repurpose) some of their existing allocated frequency, previously used for 2G (GSM), and convert it to support 4G. The 2G spectrum available to EE was in the 1800 Mhz range, as that was the 2G spectrum allocated to EE’s constituent companies, Orange and T-Mobile. Now, 1800 does penetrate buildings, but not as well as the 900 Mhz which are the 2G spectrum allocated to Voda and O2. Voda are apparently applying to OFCOM for authority to refarm their 900 Mhz spectrum for 4G LTE. Now, this would give a 4G service which had good propagation properties (i.e. travel further from the mast) and better building penetration. Glossing over (non-)availability of devices which talk LTE in the 900 Mhz spectrum, could actually be good for extra-urban/semi-rural areas which are broadband not-spots? Well, yes, but it might cause problems in dense urban areas where the device density is so high it’s necessary to have a large number of small cells, in order to limit the number of devices associated with a single cell to a manageable amount – each cell can only deal with a finite number of client devices. This is already the case in places suce as city centres, music venues and the like. Ideally, a single network would have a situation whereby you have a high density of smaller cells (micro- and femto-cells) running on the higher frequency range to intentially limit (and therefore number of connected devices) it’s reach in very dense urban areas such as city centres, and a lower density of large cells (known as macro-cells) running on lower frequencies to cover less built-up areas and possibly better manage building penetration. But, that doesn’t fit with our current model of how spectrum is licensed in the UK (and much of the rest of the world). Could the system of spectrum allocation and use be changed? One option could be for the mobile operators to all get together and agree to co-operate, effectively exchanging bits of spectrum so that they have the most appropriate bit of spectrum allocated to each base station. But this would involve fierce competitors to get to together and agree, so there would have to be something in it for them, the best incentive being cost savings. This is happening to a limited extent now. The more drastic approach could be for OFCOM to decouple the operation of base stations (aka cell towers) from the provision of service – effectively moving the radio part of the service to a wholesale model. Right now, providing the consumer service is tightly coupled to building and operating the radio infrastructure, the notable exception being the MVNOs such as Virgin (among others), who don’t own any radio infrastructure, but sell a service provided over one of the main four. It wouldn’t affect who the man in the street buys his phone service from – it could even increase consumer choice by allowing further new entrants into the market, beyond the MVNO model – but it could result in better use of spectrum which is, after all, a finite resource. Either model could ensure that regardless of who is providing the consumer with service, the most appropriate bit of radio spectrum is used to service them, depending on where they are and which base stations their device can associate with.